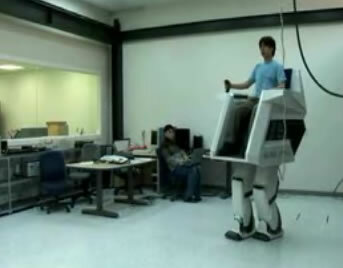 This looks cool, a walking robotic chair, the HUBO FX-1. HUBO-FX1 is the human-riding robot having 12 DOF. The development concept is that the robot can walk naturally with carrying a person or a load of 100kg, so the lower body takes after legs of human and the upper body takes after a chair. A person who sits on the upper body can control the robot naturally using the built-on joystick installed. You get more info on HUBO over at the inventors site, found via Technovelgy.com, thanks. Nice find (as always), and very cool indeed. I’ve see one that walks down stairs but this looks more accomplished. All it needs now is an inbuilt drinks cooler and an embedded universal remote and there would be no need to stand up again, ever.